In the present age in many areas the way to progress depends on being “qualified”. What is expressed here as being "qualified" is not only the ability to accomplish a job as good as possible in technical terms, but also it involves the ethical values which makes an individual superior in terms of personal qualities. The purpose of this study is to determine how ethical codes of conduct and ethical issues are perceived by women entrepreneurs who serve with public service organizations and employers. In this direction, the research was carried out on 11 public institutions and organizations employees related to female entrepreneurs and women entrepreneurs operating in the province of Mersin. Survey method was used in the survey data collection methods. The questionnaires were distributed to 500 people, 200 women entrepreneurs and 300 institution workers, and 400 questionnaires with consistent answers from the distributed questionnaires were evaluated. In the study; (ATBEQ) scale developed by Neumann and Reichel (1979). Ethical behavior perceptions of employees in public institutions and organizations related to women entrepreneurs and women entrepreneurs were measured on a question-based basis. Hypotheses established to determine whether there is a significant difference between the groups as a result of the measurements were tested by the Independent Samples t-Test Analysis. When the findings that determine the perception level of ethical behavior of female entrepreneurs and public institutions are examined, it is determined that the perception level of ethical behavior of female entrepreneurs is higher than that of public sector and organization employees. Aderemi, H. O. S., Ilori, M. O., Siyanbola, W. O., Adegbite, S. A., & Abereijo, I. O. (2009). An assessment of the choice and performance of women entrepreneurs in technological and non-technological enterprises in Southwestern Nigeria. Journal of Asia Entrepreneurship and Sustainability, 5(1), 25. Ay, C. (2005). İşletmelerde etiksel karar almada kültürün rolü. Yönetim ve Ekonomi Dergisi, 12(2), 31-52. Birinci, G. (2009). Kamu etiği ve insan hakları. Felsefe ve Sosyal Bilimler Dergisi, (8), 123-145. Brînzea, V. M. (2011). Managerial ethics and its key role in establishing an ethical work climate. Business and Leadership, 1(7), 89-105. Brown, A. J. (2008). Whistleblowing in the Australian public sector. Enhancing the theory and practice of internal witness management in public sector organisations Australian National University, 1-331. Çakıcı, A. (2006). Mersin’deki kadın girişimcilerin iş yaşamını etkileyen faktörler. Sosyal Bilimler Enstitüsü Dergisi, 8(4), 54-78. Çalık, K. (2012). Kamu yönetiminde etik değerlerden sapma: Bir kamu örgütü üzerine alan araştırması. Yayımlanmamış yüksek lisans tezi, Gazi Üniversitesi, Ankara. Davis, A. (2011). Rural and urban women entrepreneurs: A comparison of service needs and delivery methods priorities. Int. Journal of Business Science and Applied Management, 6(2), 1-16. Doğruel Mansuroğlu, Ç. (2012). İlköğretim okul müdürlerinin etik davranışları ile okul iklimi ilişkisinin incelenmesi. Yayımlanmamış yüksek lisans tezi, Yeditepe Üniversitesi, İstanbul. Fuad, N. F., Bohari, A. M., Hin, C. W. H. (2011). Women entrepreneurs in the ICT-related business in Malaysia: A demographic survey. International Journal of Business and Management, 6(10), p127. Görmez, K., Atan, M., Sancak, H. Ö. (2009). Etik, Kültür ve Toplum. Kamu Etiği Akademik Araştırmaları, 281-352. Kandemir, A. ve Deliorman, R.B. (2009). Kamu kurumu niteliğinde meslek kuruluşları ve etik. Yolsuzluğun önlenmesi için etik projesi, Kamu Görevlileri Etik Kurulu, Ankara. 1-97. Kılıç, G., Pelit, E., Altunöz, Ö. (2011). The relationship between managerial ethics perception and professional burnout levels of employee: A comparative study of five-star hotels’ employees between Turkey and Italy. Journal of Business Research-Turk/Isletme Arastirmalari Dergisi, 3(1), 122-139. Kuçuradi, İ. (2003). Etik ve etikler. Türkiye Mühendislik Haberleri, 423(1), 7-9. Kutvan, A. B. (2011). Yönetsel etik ve basın işletmeleri üzerine bir araştırma. Yayımlanmamış doktora tezi, Marmara Üniversitesi, İstanbul. Lanier, P. A. (2003). The Rise of Women Entrepreneurs. Journal of Applied Management and Entrepreneurship, 8(4), 110. MacNab, B., Brislin, R., Worthley, R., Galperin, B. L., Jenner, S., Lituchy, T. R., MacLean, J., Aguilera, G. M., Ravlin, E., Bess, D., Tiessen, J. H., Turcotte, M. F. (2007). Culture and ethics management whistle-blowing and internal reporting within a NAFTA country context. International Journal of Cross Cultural Management, 7(1), 5-28. Nwinyokpugi, N. P., Nwibere, B. M., Orodho, J. A., Okafor, G. O., Malizu, C. F., John, V., Barman, B. (2014). Managerial Ethics and Organizational Effectiveness: The Nigerian Experience. IOSR Journal Of Humanities And Social Science, 19(1),1-10. Ruacan, Ş., Enstitüsü, O. (2005). Bilimsel araştırma ve yayınlarda etik ilkeler. Gazi Tıp Dergisi, 16(4), 147. Sayğan, S. (2011). Whistleblowing ve örgütsel etik iklimi ilişkisi üzerine bir uygulama. Yayımlanmamış yüksek lisans tezi, Selçuk Üniversitesi, Konya. Soyak, M. (2010). Kadın girişimciliği ve mikrofinans: Türkiye deneyimi. Muğla Üniversitesi Sosyal Bilimler Enstitüsü Dergisi, (24), 129-144. Soysal, A. (2010). Türkiye'de kadın girişimciler: Engeller ve fırsatlar bağlamında bir değerlendirme. Ankara Üniversitesi SBF Dergisi, 65(1), 83-114. Subrahmanian, M. (2011). Women Entrepreneurs: The emerging economic Force. Thavan Ijreb, 1(01), 10-14. Yağmur, A. (2013). Etik liderliğin ve etik iklimin etik dışı davranışlara etkisi: Ampirik bir çalışma. Yayımlanmamış yüksek lisans tezi, Gebze Yüksek Teknoloji Enstitüsü, Gebze. Yüksel, C. (2006). Kamu yönetiminde etik ve Türk kamu yönetiminde etik hakkında yeni yasal düzenlemeler. İstanbul Üniversitesi Hukuk Fakültesi Mecmuası, 64(2), 167-212. Zhu, L., Chu, H. M. (2010). Motivations, success factors and problems encountered by Chinese women entrepreneurs: a factor analysis. International Review of Business Research Papers, 6(5), 164-180. ISNAD ÇELİK, Cemile , YILMAZ, Nihal . "MANAGERIAL ETHICAL VALUES IN WOMEN ENTREPRENEURSHIP (APPLIED RESEARCH IN MERSIN PROVINCE)". 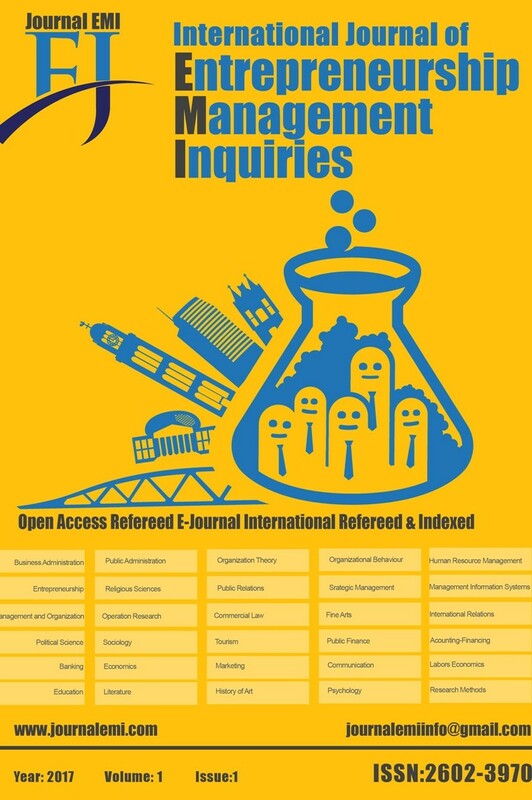 International Journal of Entrepreneurship & Management Inquiries (EMI) 2 / 3 (December 2018): 1-15.